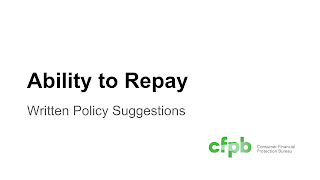 With the degree to which the Qualified Mortgage and Ability to Repay rules have affected the outlook for the mortgage industry, it comes as a surprise that an "Ability to Repay" policy does not represent a bulky and expansive document. What should it say? Something fairly simple and straightforward. As with many policies the devil is in the details. Saying you will comply is a policy. What is the PROCEDURE for complying? HOW will you comply? THAT is an effective policy. Sadly, regulators and investors focus their interest in seeing the policy as opposed to the procedure used to effect the policy. For any consumer credit transaction secured by a dwelling, Company Name must ensure that the borrower has the ability to repay the transaction. Failure to do so could allow the borrower to challenge the validity of the loan. Some transactions are exempt from Qualified Mortgage Ability to Repay requirements, however, even with loans which are exempt from a rebuttal presumption of repayment ability, we will strive to only make loans which the borrower can repay.. The following sections of our operating policies and procedures thoroughly identify the process for complying with “Ability to Repay.” We believe it is not enough to meet the letter of the law, but to fully implement procedures that allow us to ensure compliance. These operating procedures are incorporated by reference. Points and Fees – identifies our points and fees structures for the purposes of calculating maximum allowable fees. Pre-Underwriting Review Process – loan processing is the second stage of loan level ability to repay evaluation. Processing completes the Pre-underwriting review checklist to ensure all documentation to substantiate the borrower’s ability to repay is included in the loan file prior to underwriting evaluation. Items identified as missing or incomplete are forwarded to the borrower and lender staff prior to proceeding. Qualified Mortgage Guidelines – Underwriting maintains guidelines and credit policy for reviewing all loans, including the evaluation of whether a loan meets qualified mortgage requirements or not. In the event that a loan is not a qualified mortgage, underwriters will still establish the borrower's ability to repay. Credit Policy for Non-Qualified Mortgages – We and our investors and purchasers of loans determine whether, and under what conditions, loans which do not meet Qualified Mortgage Guidelines will be available and how they are underwritten. The determination of whether a loan is a qualified mortgage falls initially on secondary marketing when the loan is registered and priced. Loan Level Price Adjustments and net pricing is presented on a daily basis. As a loan is identified as a non-QM mortgage, secondary marketing must establish that there is a market for the loan, or that the loan will be held in portfolio as non-salable. Non-salable loans must STILL document ability to repay pursuant to standard practice. Company Name will not rely primarily on the sale or refinance of the collateral in determining the borrower’s ability to repay the offered loan. Interest Rate - Fixed Rate or Fully Indexed Rate for a maximum amortization period of 30 years. All debts, including housing expenses and liabilities, will be included in the calculation as required by Appendix Q of the Ability to Repay rule. If a borrower’s ability to repay changes, based on updated and revised information, the loan will be re-evaluated to ensure the borrower is still able to maintain ability to repay. As with all credit decisions, should the borrower be deemed ineligible, or unable to repay the loan, the decision will be reviewed by a 2nd level credit review to examine if there are any reasonable alternatives to assist the borrower in obtaining financing. One problem that remains endemic to process management: listing a few eligible items, and then adding the phrase "...and any other items as may be required" or "but not limited to..." Do we really think that that there are items that could be presented that we have never seen before? Why not have a comprehensive list of checklist items? This is what we try and reinforce in our discussions. 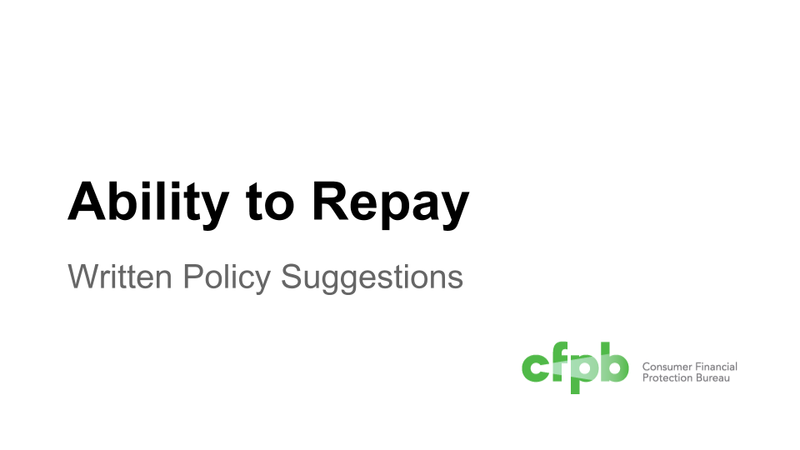 Don't write a policy just to meet a regulatory need. Make sure you integrate the way you will comply within the policy. If you, as a manager or employee, cannot see the clear execution of a policy within the day-to-day activity, then your policy likely requires you to do something that you are not currently doing. Which is a recipe for non-compliance.